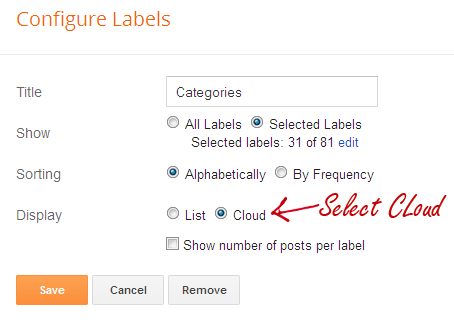 Have you been wondering how you can add customize blogger default cloud labels widget to your blog, then you are on right place. 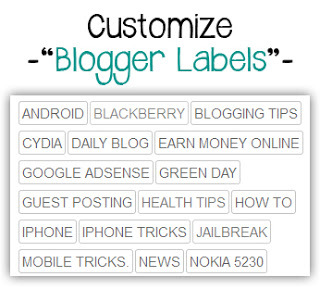 Here is a awesome looking labels widget which is fully compatible with blogger and loads pretty fast. Today I'm going to show you how can do that on your blog. Below are the steps to guide you for installation of this widget. How to Implement this on your Blog. Step 1: First Login to your Blogger Blog, Go to Layout > Add a Gadget. Step 2: Choose Labels Widget. Step 3: Before Saving the widget, Make the following changes and Save it. Step 6: Now Save Template. Enjoy your new labels widget running on your blog. I hope this post was helpful, Please express your views by leaving comments.